Paulsboro, NJ. 11/30/12 The Delaware Riverkeeper, Maya van Rossum, is investigating and speaking with agency officials on scene about a cargo train derailment that plunged several train cars into the Mantua Creek during rush hour this morning. Areas around the train derailment were evacuated due to air contamination from vinyl chloride which is a known human carcinogen. Vinyl chloride, a gas at room temperature, was present in four of the rail cars. Three of the four rail cars came into contact with the Mantua Creek. One car breached and as a result 22,800 gallons of vinyl chloride was released. It is believed that all vinyl chloride volatilized into the air but state agencies and the EPA are on scene and investigating. One of the rail cars involved was carrying ethyl alcohol (ethanol or grain alcohol). As far as we know, that car was not breached. Ethyl alcohol, or Ethanol, is a volatile, flammable colorless liquid. The spill occurred about 1.35 miles upstream from where the Mantua Creek enters the Delaware River at River mile 89.5. 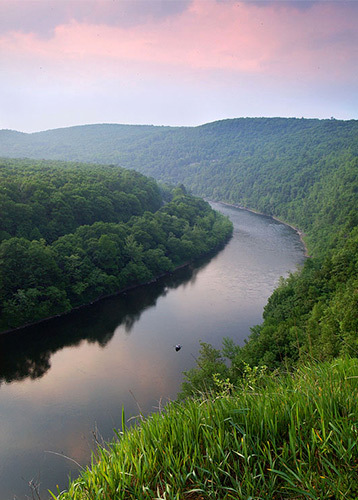 The closest Delaware River drinking water intakes belong to the Philadelphia Water Department and NJ American Water Supply - both located at River Mile 110, 20 miles upstream from where Mantua Creek enters the Delaware River. The water companies are paying close attention to the incident. The Philadelphia Water Department has said that if there was a concern requiring the water intake to be closed that would only be about 6pm this evening. The EPA requires that the amount of vinyl chloride in drinking water not exceed 0.002 mg/l. The water departments will be monitoring the situation. The Delaware Riverkeeper will continue to monitor the situation throughout the weekend and report if there are new water quality concerns. A vinyl chloride factsheet and other health and environment related information can be found here at the Agency for Toxic Substances and Disease Registry: www.atsdr.cdc.gov. Vinyl chloride is used to make polyvinyl chloride (PVC). PVC is used in various plastic products. 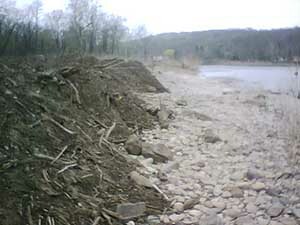 Delaware Riverkeeper Network received a hotline call on March 12, 2012 from a memberwho took photos of thousands of cubic feet of sediment, mud, tree roots and tires bulldozed along the floodway of the Delaware River on Bull’s Island near the wing dam of the Delaware & Raritan Canal. Delaware Riverkeeper Network and the volunteer on the scene called the pollution incident into NJ DEP’s hotline on March 13, 2012 requesting an inspection of the potential illegal fill (Case # 12-03-13-1441-19). 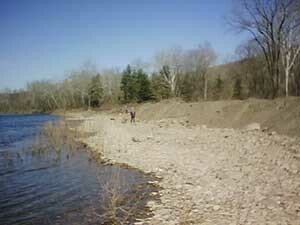 Further follow up by NJ DEP enforcement has indicated that dredge spoils from the maintenance dredging of the Delaware & Raritan Canal are the source of the fill material. Thefill material is required to be removed to an offsite stock pile location after a short dewatering period and NJ DEP is investigating permit information and disposal activity as part of the investigation. Follow up sitevisits by volunteer monitors aslate as March 25th have indicated continued grading of spoils and additional fill material added to the floodway. Delaware Riverkeeper Network has shared photo- documentation with the NJ enforcement personnel for their continuing investigation as well as the Army Corps of Engineers and continues to watch-dog the situation to ensure compliance of the permits and removal of the unconsolidated fill material from the sensitive and important floodway area of the Delaware River.